If Russia’s leading oil trader Gunvor can lose its allocations of crude oil from Rosneft and Surgutneftegas in a flash, and Novatek almost a third of its domestic gas sales in another instant, then Gennady Timchenko, a control shareholder of both companies, has some explaining to do in public. That is, if he intends investors on the London Stock Exchange (LSE) to buy shares in another company he controls in the Russian oil and gas business, IG Seismic Services (IGSS). The answer to that question also helps answer the last question Timchenko was reluctant to answer – is he running away from trouble in Geneva, or running towards trouble in Moscow? Or both? In the early Soviet era, photographs like these (below) were often airbrushed after they had been taken and published. That happened when one of the figures had lost power to Joseph Stalin, and he had had them retired, purged, or liquidated. In those days, the process was usually accompanied by public statements. If they were absent, the airbrushing of the photographic record left no doubt. The first photograph and Rosneft’s communique were issued to dispel the speculation that there were problems between the two men. Ten days later, on October 19, Rosneft announced “the results of a six-month tender to sell oil for export through the ports of Novorossiysk, Primorsk and Ust-Luga. Contracts to deliver up to 13.3 million tonnes were awarded to Glencore, Vitol and Shell. The tender process comprised two rounds, thanks to which Rosneft was able to maximise the benchmark pricing formula premium and boost export profitability for the benefit of its shareholders, which include the Russian government and 140,000 private investors. Rosneft would like to thank BP, Marubeni, Total, Trafigura, Warly and all the other tender participants for making offers and looks forward to their participation in future tenders.” Gunvor didn’t even rate a mention. Today Rosneft declines to say if Gunvor had been one of the tenderers. Gunvor is also silent. The impact on Novatek was immediately obvious. 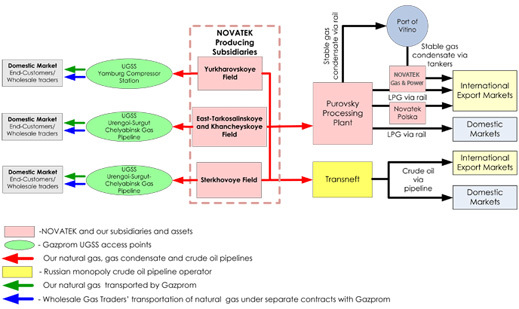 Novatek’s contract to supply Inter RAO UES with gas, signed in 2009, provides almost 30% of Novatek’s annual production and domestic sales. Also, as Sechin announced a few days ago, Novatek is not permitted to shift its output from the domestic market to exports, because Gazprom retains a monopoly of that trade. Sechin said on October 24: “We advocate the existing single export channel system, and I don’t consider making any changes to it would be advisable, since this would make gas exports inefficient both in terms of deliveries and sales.” At the time, he said Rosneft would focus on selling its gas in the Russian market. Reading retrospectively, it isn’t clear whether he means to allow, or disallow, Novatek to sell its gas for export. An agreement in July struck by Novatek and the German energy distributor, EnBW, appeared to provide Novatek’s first major export deal, though EnBW’s announcement didn’t identify its contractor partner. Novatek has declined to claim that it will be exporting the gas for the EnBW contract. Trading third-party gas, including gas Novatek’s Swiss subsidiary would buy from Gazprom, would satisfy the terms of the new contract, but preserve the Gazprom export monopoly. Why the four of them – Sechin, Novatek, Gazprom, and EnBW – would agree to arrange their business in this fashion is another matter. Rosneft says it is planning a fourfold increase in gas production to 55 billion cubic metres a year by 2020. Sechin has also claimed publicly that the target number by 2020 may be 100bcm. He is counting not only on growth of Rosneft gas output, but also on growth from TNK-BP. Acquisition of TNK-BP, which produced 35bcm of gas last year, will allow Rosneft to as much as double the volume the new Rosneft can sell, dwarfing Novatek. At the moment, Novatek is producing about 8% more gas than it did last year. For all of 2011, it produced 47.5 bcm; in the nine months to September 30, 2012, it has produced 42 bcm. Moscow investment bank analysts have noted that the Rosneft-Inter RAO deal is the first fuel contract with such a long duration in the Russian power sector. But until the pricing terms are disclosed, it isn’t clear whether the intention on the part of the Kremlin and Sechin is to reduce spot-market pricing for gas domestically, while allowing it in the export markets; these Gazprom has dominated with its take-or-pay contracts tied to the price of crude oil. To be sure, the new Rosneft gas contract will not commence until 2016. A lot can happen in the interval, even if President Vladimir Putin will still be serving his first term. In the coming days, who then wants to wager on IG Seismic Services, and buy shares of a Timchenko company? A year ago, what might have been direct competition in Russia’s oilfield services sector turned into a quasi-monopoly. IGSS had initially been shaping up to represent Integra, a Moscow-based, London-listed oil services company, with the international Schlumberger, in order to compete against Geotech Holding. Geotech was the subsidiary of Cyprus-registered Geotech Oil Services Holding. That in turn was jointly owned by Timchenko’s Volga Resources with 25%, and by Geotech’s chief executive Nikolai Levitsky with 51.5%. The remainder of the Geotech shares were owned by Geotech managers. Integra’s share price since the LSE listing has moved downwards by almost 100%; the bottom-line is loss-making; and its current market capitalization is less than $90 million. The free float is currently 151 million of 167 million shares (90%). On November 9, 2011, the merger of Geotech with the Integra-Schlumberger venture, IGSS, was arranged. Geotech – Levitsky and Timchenko — took 52% in the new IGSS entity. Now IGSS is presenting itself for a separate share listing on the LSE. In effect, this is the first time Timchenko has offered one of his assets for sale in a public stock market. From this it isn’t clear whether Levitsky is selling part of his stake into the IGSS listing. It also isn’t clear whether the new free float is entirely drawn from Integra’s free float. What is sure is that Levitsky will control fewer shares in the new company than he did in Geotech, while Timchenko appears to have strengthened his stake relatively speaking, and Schlumberger will keep the 12% stake it owned to start with. Timchenko’s Volga Resources, IGSS itself, and Geotech were asked to clarify what the London listing is intended to achieve, and how they see the distribution of shareholder power in the post-listing arrangement. The spokesman for Volga Resources, Anton Kurevin, refused to reply. IGSS lacks its own press and investor relations service, and refers questions to Geotech. Victoria Smirnova, the Geotech spokesman, responded that no official comment can be made at this stage. According to Integra, the pre-listing shareholder lineup of IGSS is 36% owned by Integra (of which public shareholders comprise 100%); 12% by Schlumberger; and 52% owned by Geotech. Geotech’s shareholding structure comprises 76% owned by Levitsky and Timchenko, and 24% by other “private equity stakeholders”. According to Machanskis, it appears to be the last bloc of shares which will be sold or added into the new free float. “Depending on the results of listing without a sale, the shareholders of IGSS will pay dividends to their ‘public’ shareholders. Integra will pay 36% to their shareholders; Geotech will pay 12.2% to theirs. In this fashion, the free float will be formed: 36% +12.2% = 48.2%.” A source close to the listing plan says that Levitsky of Geotech will not be selling any shares.